How long have you worked for Heifer? About six years. What attracted you to work for Heifer? My former owner in Scranton, Arkansas, thought Id have a better quality of life if I lived at Heifer Ranch. What has been the most memorable experience you have had while working for Heifer? I really enjoy the visitors who come to the Ranch. For some of them, I am the first llama they have ever seen. Some even think I am a donkey, until they get to know me. 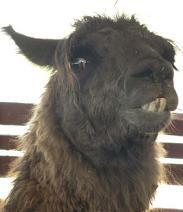 My hobbies include: Snacking on hay and dazzling Heifer staff and visitors with my dashing smile. My family consists of: Various farm animals. My new neighbors include several baby goats that were born at the Ranch in mid-March. Something about me that you might not know: I am used as a pack animal in Global Village 1 and carry feed up and down the steps and across the bridges to all the other animals. What is the best thing about working at Heifer Ranch? Helping educate visitors about the benefits llamas can bring to Heifer families in Latin America. We eat the scrub vegetation that other domesticated animals won't eat. Our droppings help fertilize topsoil  improving crops and reducing erosion. In addition, we provide invaluable sources of transportation, income and wool, which is prized for making blankets, ponchos, carpet and rope.